The 1964 classic directed by George Cukor is getting the Blu-ray treatment in November! 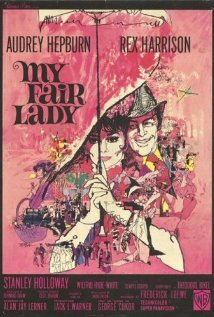 In an early announcement to retailers, Paramount says 'My Fair Lady' is planned for Blu-ray on November 15. The musical starring Audrey Hepburn, Rex Harrison and Stanley Holloway was nominated for twelve Academy Awards and won eight including Best Actor (Harrison), Best Art/Set Decoration, Best Cinematography, Best Costume Design, Best Music, Best Sound, Best Director, and Best Picture. Specs, supplements, and suggested list price haven't been finalized as of yet. You can find the latest specs for 'My Fair Lady' linked from our Blu-ray Release Schedule, where it is indexed under November 15.